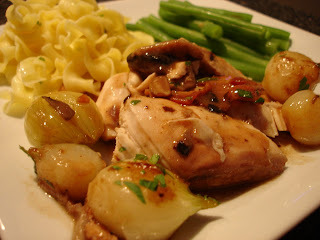 Coq Au Vin... a classic French dish of chicken and wine. I've never had it, have never seen in it person (only on cooking shows), but for some reason I really felt like trying it this week so I put in on our menu. I browsed several recipes and read about it, and decided to follow this recipe. 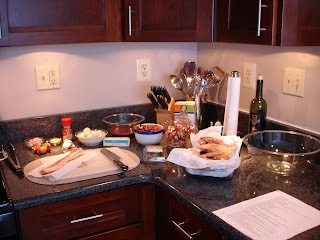 Since I have never made or tasted Coq Au Vin, I followed each and every step. Now that I've made it, I don't think I'd change a thing, although I may try using boneless breasts next time since I don't like the thighs or wings. 1 6-pound roasting chicken, backbone removed, cut into 8 pieces - 2 drumsticks, 2 thighs, 2 wings with top quarter of adjoining breast, 2 breasts (I used a 4.5 pound chicken already cut into the pieces noted above). I always get everything prepped before I start cooking - this pic is after my mess from prep was cleaned up and doesn't even show Monday's marinating prep or how many times I (Jon) needed to wash out the dish I was using for the chicken! Combine wine, onion, celery, carrot, garlic, and peppercorns in large pot. Bring to boil over high heat. Reduce heat to medium and simmer 5 minutes. Cool completely; mix in oil. 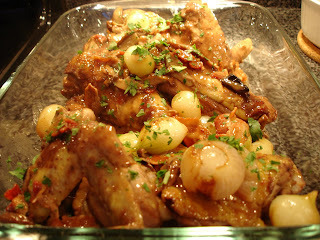 Place chicken pieces in large glass bowl. Pour wine mixture over chicken; stir to coat. Cover and refrigerate at least 1 day and up to 2 days, turning chicken occasionally. Here is how it looked as it went into the fridge.. Using tongs, transfer chicken pieces from marinade to paper towels to drain; pat dry. Strain marinade; reserve vegetables and liquid separately. Heat oil in heavy large pot (wide enough to hold chicken in single layer) over medium-high heat. Add bacon and sauté until crisp and brown. Using slotted spoon, transfer bacon to small bowl. Add chicken, skin side down, to drippings in pot. Sauté until brown, about 8 minutes per side. Transfer chicken to large bowl. Add vegetables reserved from marinade to pot. Sauté until brown, about 10 minutes. Mix in flour; stir 2 minutes. Gradually whisk in reserved marinade liquid. Bring to boil, whisking frequently. Cook until sauce thickens, whisking occasionally, about 2 minutes. Mix in shallots, garlic, herb sprigs, and bay leaves, then broth. Return chicken to pot, arranging skin side up in single layer. Bring to simmer; reduce heat to medium-low. 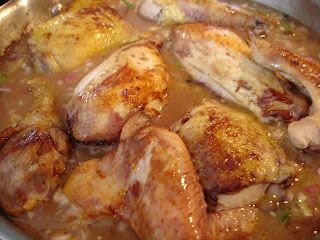 Cover pot and simmer chicken 30 minutes. Using tongs, turn chicken over. Cover and simmer until tender, about 15 minutes longer. Melt 3 tablespoons butter in heavy large skillet over medium heat. Add mushrooms; sauté until tender, about 8 minutes. Melt remaining 1 tablespoon butter in same skillet. 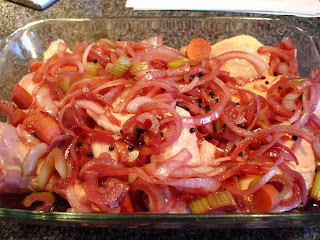 Add onions and sauté until beginning to brown, about 8 minutes. Transfer onions to plate alongside mushrooms; reserve skillet. Using tongs, transfer chicken to plate. Strain sauce from pot into reserved skillet from onions and mushrooms, pressing on solids in strainer to extract all sauce; discard solids. Bring sauce to simmer, scraping up browned bits. Add onions to pot and bring to simmer over medium heat. Cover and cook until onions are almost tender, about 8 minutes. Add mushrooms and bacon. Simmer uncovered until onions are very tender and sauce is slightly reduced, about 12 minutes. Tilt pot and spoon off excess fat from top of sauce. Return chicken to sauce to rewarm. I'm not going to lie - this was a lot of work. There was nothing difficult about it, but it was three hours of almost constant cooking. I'm crazy for doing this when it was 95 degrees out, but it was well worth it. Next time I'll make it in the fall or winter. Jon and I usually eat spicy things, or dishes full of garlic, red pepper flakes, or even cayenne. So this dish wasn't what we'd define as "our" flavors, but I was extremely impressed. Jon had very low expectations when I explained the dish to him, and even he was impressed. We'll see if he has a comment to add... My comment to Jon is "thank you".... he kept cleaning up after me as I was cooking. Otherwise the kitchen would have been a mess!!! This recipe requires a lot of dishes. I'd recommend this to anyone wanting to try something new, or someone who has a few hours to spend in the kitchen. Marinating the chicken for 36 hours was key, and I don't see any steps that could have been omitted. I kept the sides simple. I served buttered noodles (cooked egg noodles, then melted butter in a pan until it browned just a bit; poured butter over the noodles, tossed and topped with fresh parsley) and steamed green beans. I think mashed potatoes would be a nice side as well. Oh, and of course we had French bread! I don't think I have ever had French food before, but I now have an appreciation for it and would like to try a French restaurant (maybe for our upcoming 5 year anniversary?). I loved the complex flavors that came out of such simple ingredients. Now I'm looking around for more French dishes to try! Recommendations always welcome! OHHH my gosh, this looks amazingly delicious! i'm bookmarking this recipe for SURE!! Looks delish! I've never had this either. Wow, very impressive! Looks delicious! This looks awesome. I have been wanting to try Coq Au Vin. Great job - I know it was a lot of work! I've got to say - yes, I had SUPER low expectations for this one, and happily, I wasn't disappointed. For me, I think the (limited) French food I've had tends to be a bit subtle, and this was certainly in that category: good flavors, but none REALLY stood out to shine. No question this one was a challenge (and a LOT of dishes), but if you've got the time, a good experiment to try. AND - buy lots of wine - you'll need it for the time it takes! Just recently started reading your blog, and love it so far! The pictures of your creations are gorgeous. They're very romantic, reasonably priced, and I'm curious to see what your opinion of them will be!